Here are the presentation slides of the lecture I gave to the students of the game development program at the METU Informatics Institute. Enjoy! The distribution of scenes among acts is an important issue in structuring stories. There needs to be a sense of proportion in order to keep the experience balanced for the reader/player. In this article I first have a look at how it is usually done in feature films. I present some bad examples to make it clear what disproportion takes away from the audience. Later on I have a look at how games use scene proportion and what can be done to improve game designs by making use of this concept. In most cases we would come accross four quarters; one allotted to the beginning act, one to the final act, and the remaining two to the middle act. Such scene distribution can be seen in a variety of comics, too. Just think of Dylan Dog, Ken Parker, Lucky Luke or Asterix. This first example takes too long to create the conflict, hence the beginning is out of proportion. The audience will wait for something intriguing to show up, but since this will take too long, they will get bored early on and lose faith that anything interesting will happen: that’s where they would zap to another channel. The second handicap of this example is that it has a too narrow middle, the meat of the story is not enough to satisfy the audience that wants to enjoy how things develope. And just as we think that things start getting interesting, it ends abruptly. That’s the third handicap. It’s a simple fact: bad proportioning brings the spectator’s expectation out of balance and ruins the experience. This second example looks good for the first two acts, but the denouement (the after-word) that follows the climax is way too long; it asks us to stay there for things that do not matter anymore since the conflict has been resolved and there’s nothing more to achieve. More than that, the spectator starts to wonder whether the story is now finished or not. Being busy with such questions, the joy that came from the great finish will fade away instead of remaining as something great to tell to friends if the end would have been kept tight. Is it a bad thing to have such a huge middle act? Actually no: the middle is a very valuable part, because it “hangs” there with the support of beginning and end. Since its joints with beginning and end are (ideally) of a logical nature, the middle is in possess of telos, that is, it is headed towards a goal (the solution) and driven forwards by the strong current of a source (the conflict). Hence, as long as it is justified and exposed in the beginning, and flowing in unity towards an (anticipated) end, theoretically, the middle could be expanded endlessly. While games’ ability to blow up the middle looks in contradiction to the structure of the rather equally proportioned commercial feature film, we don’t need to go very far to find something similar in the media world: In terms of broadcasting formats, we can compare games’ elasticity in regard to the middle, to that of the TV serial. The plotlines in TV series are planned to last over longer periods. In the pilot program, an initial problem is set up for every character, their interests are put up against each other. After this necessary introduction, the struggle among characters is being laid out over several chapters, turning into many directions (quests, subplots etc) along the process. Only on the final day of the series, all plotlines are brought to an end. So, the bulk of time is alotted to the middle. Still we must notice an important difference between the game’s structure as a whole (which resembles the overall structure of TV series) and the structure of the single levels that make up that whole. A single level will most likely be structured like a feature film, that is, it will have its own three act structure divided into quarters. 1. The first type of mistake would be in regard to the overall game structure. If the design is too late in establishing the conflict (a too long beginning) or if it continues too long after the climax/resolution (a too long end), we’d either lose the audience before they even arrive at the middle, or we’d ruin their enjoyment of the climax. 2. The second type would be in regard to the structure of particular levels. Regardless of where the level is positioned within the overall structure of the game’s narrative, if the particular level takes too long to set up its problem and goal, or if it allows the tension to fall too much after reaching the solution, we would have presented to our players a rather less enjoyable experience. A few such levels in a row could see them quit. Finally it must be said that a too long middle can break the faith of a player, too. If the player feels that it will take too long to connect the beginning to an end, she might just give up playing. This requires designers to make sure that the middle and the levels that it is constituded of always drive the story forward, and that they don’t feel like we’ve got stuck in a unnecessarily long (row of) side quest(s). In this article I tried to share some insights on narrative design in regard to the proportioning of acts/levels. I claimed that most games’ overall structure resembles that of TV series, while particular levels seem to be closer to feature film structure in their proportioning. While it is evident that these claims need to be supported with more research in order to be verified, I still hope that the perspective I put forward here will help narrative designers in structuring their stories in a more compelling way. 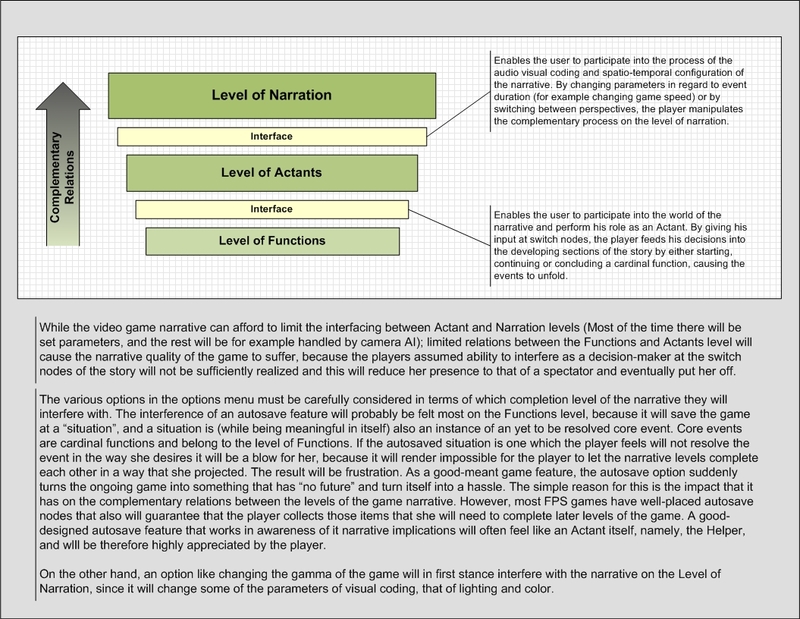 I’m right now in a very fruitful process of writing and diagramming my thoughts on Game Narrativity. I don’t really know where it will carry me to, but I just feel somehow that something “programmed” in me knows the way. Whatever that thing is, it feels right and I feel I need to follow it. One of the diagrams I prepared this evening. Click to enlarge! A diagram based on the concept of Completion Levels in Barthes' study on narrative. 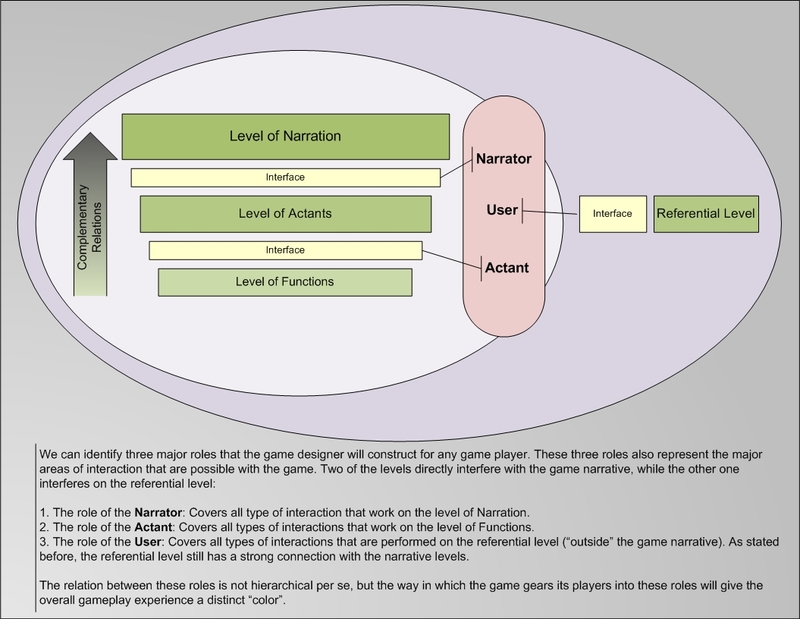 The three roles a game designer will have to construct for the player of her game. 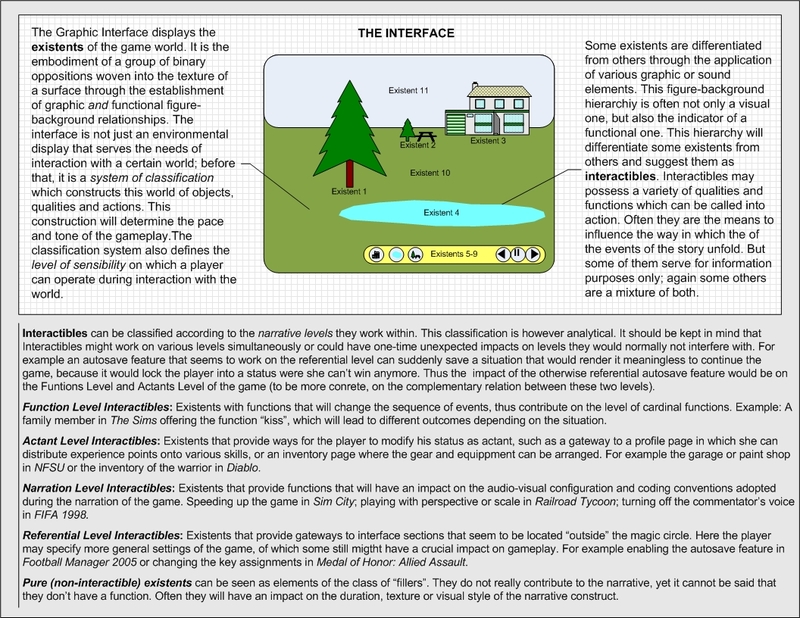 The Interface, a classification system that enables the player to perform on all narrative levels. Oh my, I really need some feedback on all this!